These pipes replace your factory catalytic converters, letting all the exhaust pass through freely, but not the noise. 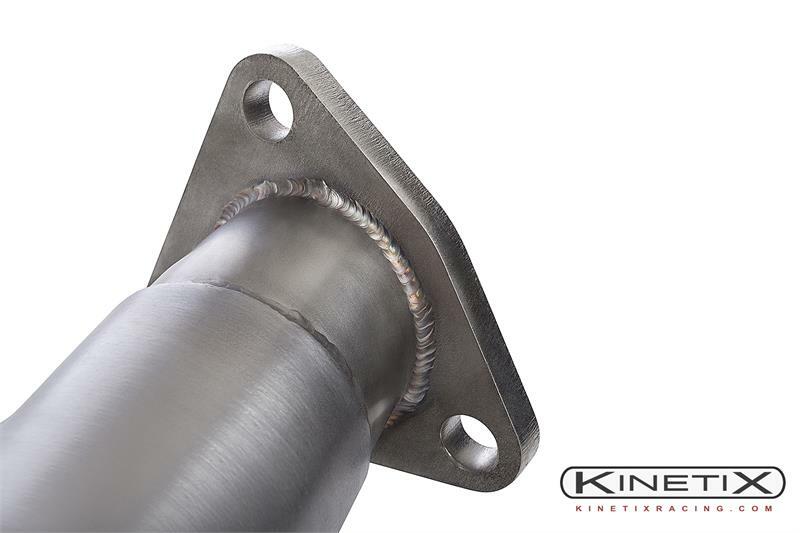 Plain test pipes offer the highest level of flow, but often result in a "raspy" exhaust note between 3-4k rpm. Test pipes have always been high on the "bang for the buck" list, but the louder exhaust tone can be too aggressive for some people. So we now offer a full stainless straight through converter replacement, but with a stainless exhaust resonator welded in-line. This gives an equal amount of flow, but with less raspiness. The exhaust note will only be slightly louder, and have a slightly deeper tone. Catalytic converters are the biggest "choke" point in the exhaust. These pipes have shown a 5-10hp increase at the wheels on factory 350z's. Our high flow catalytic converters will show almost equal gains, but straight throughs are a MUST for any FI application. On Turbocharged cars (example Greddy) we consistently see gains of 25-35 hp !! with faster spool times. Constructed entirely of S.S. and feature true mandrel bends and 3/8" thick flanges with a highly polished 4" body full stainless resonator on each pipe. They also feature factory located O2 oxygen sensor bungs so factory sensors are retained. They will bolt right up to either factory headers or aftermarket headers. 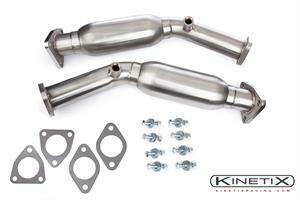 They are also compatible with either factory or aftermarket exhausts. All of our converters come with new hardware including bolts, washers, and lock nuts.